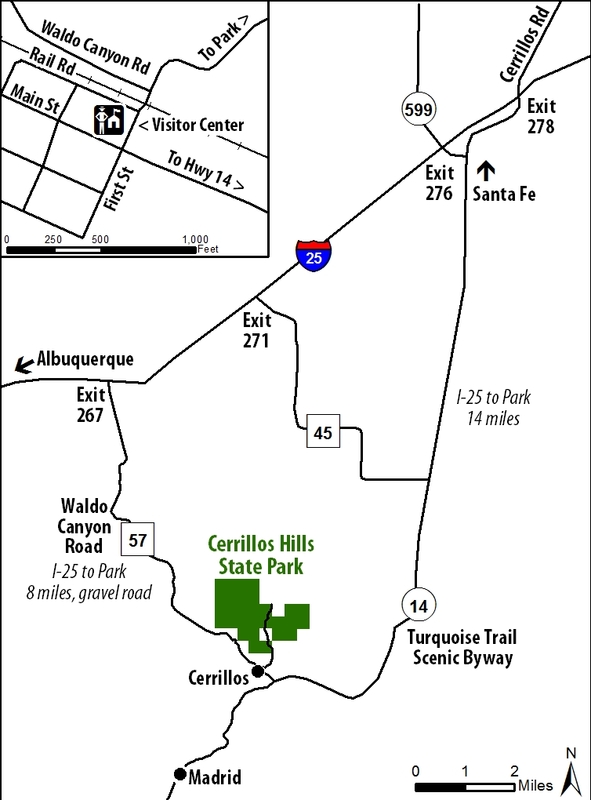 The following PDFs are provided to help you with planning your trip to the Cerrillos Hills State Park. The Reliable Route: From State Highway 14 turn west into the village of Cerrillos. At the first stop sign, turn right (north) onto First Street, cross the railroad tracks and follow park signs. At the cattle guard, veer left, onto County Road 59. The main parking is on the left hand side about 1/4 mile up the road. The Adventurous Route: From I-25 take the Waldo Canyon exit (Exit 267) at the top of La Bajada hill and head south. After 8 miles on unpaved County Road 57, you will arrive in the Village of Cerrillos. Take a left at the railroad intersection and follow park signs. At the cattle guard, veer left onto County Road 59. The main parking is on the left hand side about 1/4 mile up the road. County Road 57 may be impassable during wet weather.